My New Ending | Hoping to inspire someone else in their healthiness journey while I share about mine. This may or may not be the last time I post here, but I feel a need to post that if I decide to quit blogging it will not be because I’ve given up on my health. Ten years ago this May I started blogging to talk about my struggles with food with someone and hoping that in putting my issues “out there” I would inspire anyone else who is struggling that they aren’t alone. It was exactly what I needed at that time. Over the next years I became one with my phrase “my new ending” and it became part of my identity. However, when I started gaining weight back after maintaining my loss for over a year I began to feel like I’d let down the “new ending” part of me, and anyone who was inspired by it. This last year brought a change I never saw coming — another move when we thought we’d found our settling place — and shortly thereafter I made a decision to quit dieting. I decided to heal my relationship with food and learn to nourish my body with what it wants and needs, not simply restrict to fit into a certain size of clothes. Does this mean I’ve given up? Absolutely not. The introspection and forcing myself to face why I choose regularly to overeat is actually a lot harder than sticking to a diet and stuffing down the “why”s. In the past I would blog to share about this journey and the success I was making; however, right now this blog and my Instagram account by the same name are proving to be more triggers than helpful. The line “my new ending” reminds me of dieting and so, for now, I will not be blogging and I’ve disabled my Instagram account. The only reason I don’t delete both is because this is all part of my story and I’m not 100% sure I’m ready to give it up completely. Maybe when it’s time to renew the domain I’ll make the decision whether or not to keep the blog up. We shall see. Part of me would love to keep journaling online about my journey, but another part of me feels I have really moved on and it’s time to embrace a new chapter in my life. Thank you to those of you who have been faithfully following and encouraging me in my journey. It has meant a lot! There’s a whole year ahead…365 days of opportunities and choices to be made for the better of my health and I look forward to continuing to take it a day at a time…even if I don’t share about it all online right now. Christmas decor is up around town, the temperatures are cooling (even here in San Antonio, GLORY!! 😀 ) and here in the United States we are celebrating Thanksgiving on Thursday. It can be so cliche to think of the things we are grateful for this time of year, but I find it can be especially helpful in a season where sometimes the failures and hopes and dreams not answered through the year can be so glaring. That doesn’t sound very pleasant, but coming from a person who would rather always look on the bright side than acknowledge the ugly for more than oh an hour or so it’s a big step. I have come to learn life isn’t always pleasant and I make it go away like hugging a scary monster dream away from one of my children. What I can do is learn to accept life can be sad, ugly, frustrating, etc. and allow myself to be okay with the sad moments, because they also are a part of what makes life as a whole wonderful. There are two sadnesses, if you will, that are on my heart entering this season. One is a little too personal to share, so I will not burden you with it. The second is I am sad that I’m entering this holiday season wearing the same large clothes I bought last year. I will still fit the outfit I even took a picture in and designated it my final “before” picture. Can I pause in that frustration for a minute? That shirt might even be a little snug, I haven’t actually tried it on yet and the 10 pounds I’ve added to my weight this year has been just enough to make some outfits uncomfortable. Okay, now you know… I’ve gained weight instead of losing it this year. When you’re ready to see what else has happened keep reading. Looking on the bright side. I’ve come to a conclusion that photo is still a “before” picture of sorts…. ….before I found out we would be selling our new home and moving to another city. …. before I before I decided that I didn’t want to live a low-fat/low-carb lifestyle and quit Weight Watchers last spring. … before I hugged my baby at his high school graduation and faced the fact that the chapter in my life as a stay-at-home mom was complete. … before I settled in a new town, again. … before I found the Nutrition Redefined podcast that lead me to Eat Confident Collective. The final before is the news I have to share and it has been my early Christmas present to myself. Eat Confident Collective promotes intuitive eating and accepting health at any size. I’ve been with the Collective for about a month now and my mind and emotions have swung from relief at not having to always worry about when and what I’ll be eating to overwhelm that I’ll never be able to trust and obey my hunger and fullness. This is a very scary process for me at times and my first step forward was to give myself some permissions. First, I am giving myself the gift of permission to not be on a diet before, during or after the holidays. Second, I am giving myself permission to feel beautiful all season, despite gaining back about 60 pounds. Finally, my goal this season is to be able to accept what I see when I glimpse myself in any photos that will be taken this season. Along those lines of self acceptance I made another decision with regards to sharing my journey. For months I’ve been thinking about deleting this blog because I feel I have nothing positive to share — “positive” being equal to weight loss, which is a mindset I’m trying to change — but I came to the conclusion that this is part of my story. So, I will continue blogging. Since 2009 I have striven to be honest and open about my struggles with food in on this blog with the hopes someone will read something they can relate to and be encouraged they are not alone in their struggles. To end it now would be a disservice to anyone who may still be looking for encouragement here. So, here I am. As always, I will never give up my pursuit of a healthier, happier life. Thank you for stopping by and I wish you all a safe and happy holiday season! Well, about two months back on track and I have had a breakthrough. The shame and fear of rejection was very real. It was very easy to share a story from a time when I was healthier when I was a smaller size, but having gained so much weight back I have had the hardest time saying anything like, “…yeah, I had just returned back from a run when …”. My mind would remind me I’m not that healthier version of myself anymore, so I would only softly mention the running or I would follow up the story with a crack like, “Not that I’m doing that [running] now!” trying to make everyone laugh and say what I felt they were thinking. 1. I started running again with the Couch to 5K program. 2. I forgave myself for gaining the weight back. The first action has been fairly easy. While I feel every ounce of the weight I’ve gained back, I just ran a 5K in the spring, so I have been fine. The second was much harder, but forgiving myself for failing to keep control over food during some of the hardest years of my life was the key I needed to lock up all the negative and throw it into the sea of forgetfulness. Forgiving myself also included repenting of the part I played, the times I just didn’t care and overate until I didn’t feel good, and it brought me to a place where I could hold my head high again. When I’m plodding along on the treadmill completing my run/walk intervals I hold my head high. When I am sharing a story about my family that includes me returning from a run to see my family being crazy I hold my head high while mentioning the words, “I had just come back from a run…”. When I wear an outfit that is bigger in size than I’d like, I hold my head high. Month one I maintained weight and now in month two I am seeing the scale slowly move downward. It may not sound like great success to anyone who is looking for numerical victory, but I haven’t felt this good both physically and emotionally in a very long time. I’ve been journaling and I have goals to help me stay focused as I continue in my journey, but for today I celebrate that I am walking with my head held high. This is my story and I will never give up. Thank you for coming along with me. Hello there! Here’s a little clip of me…happy because one of my friends sent me a belated birthday gift with a couple of my favorite things. Videos like this are fun to make, but lately they are hard to watch. While photos or videos are being taken I feel cute and pretty; but when I view said material I see the reality of what settling into a lazy kind of comfort has done to my body. It’s a reality check of sorts that is both upsetting and good for me. I never let my weight stop me from living my life before and I’m not going to start now. These photos capture where I am currently and they remind me why I’ve made the decision to pursue a healthier lifestyle again. Part of pursuing healthier goals is journaling. 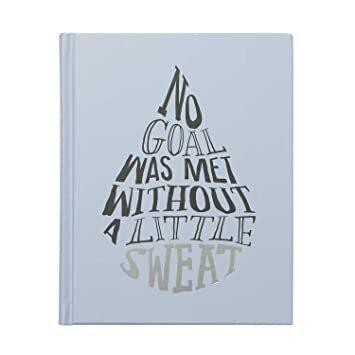 I do this both by blogging and I’ve purchased a fitspiration journal which has prompts to help get my mental juices flowing. Most of the time I quickly glance over the preprinted stuff, but today’s inspiration caught my attention. It’s a common enough phrase, but when I’m honest it’s not one I really wanted to see just yet. However, I got to thinking… In recent months I found myself getting comfortable in an old lifestyle of not getting much intentional exercise in, eating whatever I wanted with very little tracking, and quite frankly it lead me to feel very uncomfortable. I’ve been physically uncomfortable and emotionally uncomfortable when I see how large I’ve become and thus what others now see when they look at me. Isn’t that ironic? My old “comfort zone” made me uncomfortable. Making time for exercise in the mornings and being intentional about my food intake, disciplining myself to pay attention to both what my body wants as well as needs, actually leaves me feeling more comfortable. So, that is why I am choosing to take the steps necessary to lose weight and get healthier again. I love myself too much to continue being “comfortable”. I hoped I’d never see this day, the day that I would have to say I have gained back almost all of the weight I lost from 2009 – 2013. But I have. And I’m humbled. I wasn’t exactly embarrassed until I saw the last 20 pounds come back on, 10 of which came on in the last month while moving. And when I realized I’d gained those 10 pounds I also realized something else. Food has been my coping mechanism for stress. It seems like an excuse to say that, but I had maintained my weight loss for over a year and then a succession of stressful situations began to occur and aloing with the stress came the weight. I have researched, discussed the subject with friends, prayed much and the only conclusion I have is I have to learn how to handle stress and not let it affect my healthy habits to the extent it has these last 4 1/2 years. PC: Pinterest — Such truth to this! So, that’s where I am today. Humbled by my inability to keep control over my overeating. While it seriously pains me to make this public I have to, so when I come back those who follow will know where I started from again. I’m 224.2 pounds as of this morning. I feel every bit of the 60 pounds I’ve gained back, and I cling to a sliver of hope that I can get it off again. Me this morning after my walk. 224.2 and pooped out. And I’m returning to blogging, because I still hope the details of my health journey can help someone else know they are not alone in the struggles that surround this kind of journey. A week ago I gained 3.2 pounds. I know exactly what happened and wasn’t surprised by it. The “honeymoon phase” was over. My desire to stick to a plan, tracking points, trying to stay focused and my reading on the subject of binge eating was all wearing thin on me, so I ate what I wanted. I didn’t binge, at least not that I can remember, but I did eat when I wasn’t hungry and not really care. Except I did care, which is partly why I was so vexed. I was reminded, again, that living a healthier lifestyle, for me, includes not giving in to every desire. And I didn’t like that thought. After doing some research and reading I feel I do have a very slight issue with bingeing; manifesting in the form of mindless snacking to avoid a number of things I should be doing or feelings I don’t want to feel. However, the reading, praying and researching lead me back to what I’ve known all along. I want to have my cake and eat it too, or two … as in pieces of cake I had a baby shower the week of the 3+ gain. So, I had to come to a decision again. Do I want to be healthier and feel good while enjoying treats in moderation, or do I want to eat whatever and however much of what I want and feel like crud more often than not? Which is why the next week I tweaked what needed tweaking and managed to lose what I’d gained plus an added 1.6 pounds for a total loss this past week of -4.8 pounds. The honeymoon phase is definitely over in my journey, but I have decided I want to make this thing work. And I am getting it done. Unless you’re brain is wired like mine you won’t understand, but let’s just say that what works best for me in losing weight is not only a good plan to follow, but the time to work through why I am eating in secret and overeating. Because I’ve learned it’s not simply that I have no self discipline (which I know is part of it, so I’m not using this as an excuse), but for me there’s a whole lot more to it than that. That’s why I really feel like this is my year to get back to my old “new” Leah. For three consecutive years — 2014 through 2017 — I faced life changing experiences I’d never had to deal with before. Death, child illness and the nest beginning to empty are the ones I’m comfortable sharing about. There were others that are much more personal. In spring of 2016 I went to Weight Watchers because I was gaining back weight during these traumatic times and I was scared of gaining all of my weight back. It helped in that I stopped gaining, but a year later I found myself weighing exactly the same. Life was continuing and I didn’t feel I had the head space to do more for my weight. Or I hoped if I exercised faithfully the weight would drop off. Um, if you don’t change your eating that doesn’t happen as easily at 41 as it did at 32. Anyway, over the summer 2017 I took a break, moved into our new home. Then I enjoyed the holidays. I did more thinking about my life where I want to go, who I am, etc. etc. and I saw the weight creeping up a few more pounds. So, in early December I said I am going back to Weight Watchers, because I need the structure and the motivation from the meetings. I told myself I wouldn’t put too much pressure on during Christmas and New Years, but in January I would truly begin. While I enjoyed time with my family I began to think. And to pray. And calm came and I felt ready. Ready to deal with things I had allowed back into my brain that were leading me to turn to food; and deal with layers that had been exposed during my recent life changing experiences and realize [again] food is not the answer. The scale is down about -5.0 pounds so far, but what is falling away inside is so much nicer than what is falling off outside. It’s like as I work through my emotions I’m losing the bad inside and it’s making way for healthier thoughts and habits to begin again. It’s been tough, and I’m no where near the end, but I feel so much better about where I am that I had to share. For anyone who still comes to check on me here on the blog I had to share that I’m still not giving up. I do have issues, but I’m taking them to God and doing some secular reading on relationships with food and I’m feeling so much better already. This really is my year and I look forward to seeing all that is going to happen, both inside and out. Four weeks ago I made a decision a lot of people have been making in the last week. I went back to Weight Watchers. Life is settling down, I need the structure and I decided waiting for January was not an option. They had a special for the first month free if you signed up for six months, so that sealed the deal for me. My Monday meeting group is amazing and they welcomed me back with open arms just like I expected. Returning to a program, having gained a few pounds, is humiliating enough without worrying what others will think. So, when I returned and they appeared so happy to have me back it really helped me. I’m down 5 pounds these first four weeks and grateful for the refocusing that is coming along with the loss. This is in the beginning of my Carpe Diem planner I’m using to motivate me and journal about my health journey. As cliche as it sounds I’ve chosen my word of the year to be “focus” for the main reason that I feel this is my year to get back to a healthy weight. Two years ago I went to Weight Watchers in an attempt to stop gaining weight back. It was a lifesaver and I still have a couple friends from that time. Unfortunately, I was still going through so much emotionally I didn’t do more than stop the gaining process. But life is settling for us now in so many ways and I feel I have the head space to really focus on my weight; and time to really also focus on why I do what I do with regards to my health. That may be odd to some, but I’ve learned that when life is topsy turvy the last thing I want to do is stress about good eating habits. Or, maybe I’m just finally tired enough of feeling like a victim of recent past circumstances and ready to lay them to rest and move on to recapture the healthier, stronger lifestyle I was living when I was maintaining my 70-pound weight loss for over a year. Either way, I’m here and I’m going to work on keeping focus. Here’s to a great 2018! This will help me focus in other areas as well! I can hardly believe it’s November! Where did October go? “Hi, I’m Leah…as I waited for my son after school today I tried to gather my thoughts to share where I’m at right now. When I was living with the success of being a woman who lost 70 pounds I wanted the world to know they could do it too. “If I can do this anyone can!” And I loved sharing my story so others could see there was hope. But currently? My world has been turned upside down, my life plans got all turned around, I realized some serious thought processes needed tweaking, I’ve gained 50 pounds back and, after all that, I’m coming to a place where I am accepting things will never be like they were prior to the last 3 1/2 years. So, in recent days I’ve been praying and accepting life will never be what it was the first time I lost that weight. That my health journey now isn’t a recovery of all I lost; but it’s a new journey wherein I allow the healing happening within to help spur the new decisions to take better care of myself. Two week after posting the above I’m happy to say things have gotten better in my health world and November is already off to a good start. Taking time to really analyze where I am, working through the fog instead of wishing it away while I overeat, and continuing to press forward has proven good for my all-around health. My story’s not over folks. 🙂 Thank God!